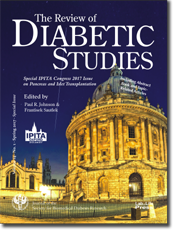 The Review of Diabetic Studies is the Society's journal publishing peer-reviewed and selected research data from leading scientists. More about the journal's aims, publication principles and subscription fees can be found here. To improve the spread of knowledge and to increase the transparency of diabetes-related research findings the SBDR supports the Diabetes Open Directory (DOD) - a global open directory project. The DOD is a growing web which serves the free spread of information and unrestricted transfer of diabetes-related knowledge. Learn more about the DOD here. 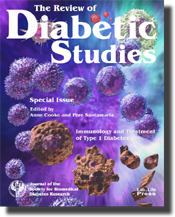 Join the SBDR and take advantage of a regular subscription of The Review of Diabetic Studies. Other benefits include reduced registration fees for topic-related conferences, and travel awards held ready for SBDR members. The SBDR is a member of CrossRef. The RDS is indexed in DOD and Medline/PubMed.